The fourth annual conference on the Governance of Emerging Technologies: Law, Policy and Ethics, was held at the Tempe Mission Palms Hotel and Conference Center, in Tempe, Arizona, on May 24-26, 2016. The conference consisted of plenary and session presentations with discussions on regulatory, governance, legal, policy, social and ethical aspects of emerging technologies. Keynote speaker was Mildred A. Solomon, President and CEO of Hastings Center. The third annual Conference on Governance of Emerging Technologies: Law, Policy & Ethics was held at the Scottsdale Resort & Conference Center on May 16-28, 2015. Keynote addresses were given by Mustafa Suleyman of Google DeepMind, and renowned bioethicist Jonathan D. Moreno. Plenary sessions addressed subjects including free speech and privacy, technological unemployment, inter-generational equity, the politicization of science, and security and just war theories. The second annual Conference on Governance of Emerging Technologies: Law, Policy & Ethics, was held at the scenic Talking Stick Resort, in Scottsdale, Arizona, on May 27-29, 2014. Keynote speakers included Tom Kalil, Office of Science and Technology Policy, and Michelle Chibba, Director of Policy and Special Projects, Information and Privacy Commissioner’s Office (Ontario, Canada). 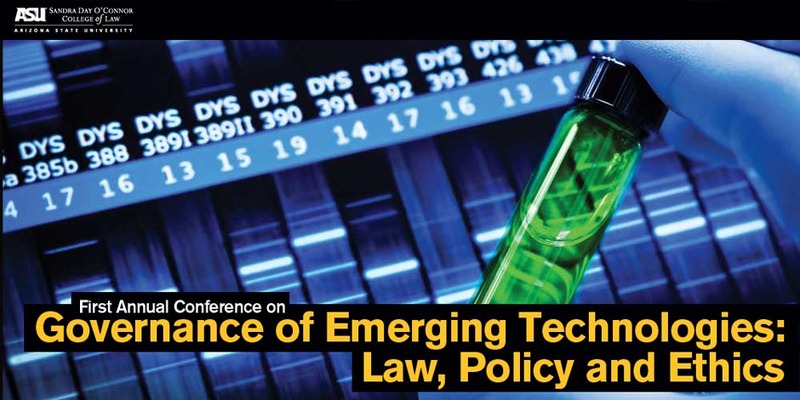 The conference consisted of plenary and session presentations and discussions on regulatory, governance, legal, policy, social and ethical aspects of emerging technologies on a broader scale. The first annual Conference on Governance of Emerging Technologies: Law, Policy & Ethics, was held May 20-21, 2013, in Chandler, Arizona, and featured sixty-five presentations and over one hundred attendees. It focused on the GRINN technologies (genetics, robotics, information technology, nanotechnology, neuroscience), which present unique governance issues and challenges, due to their rapid pace of development (faster than traditional regulatory systems can keep up with), profound impacts that go beyond health, safety and environment risks, and ethical and social concerns affecting a broad range of stakeholders and interests around the globe. It featured top experts in a fascinating and crucial exploration of the overlapping regulatory, governance, legal, policy, social and ethical issues of such technologies.